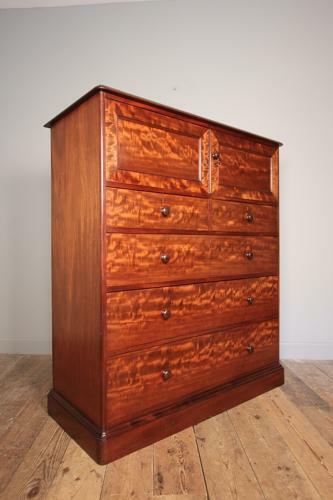 A superb plum pudding Mahogany chest of drawers by Gillows of Lancaster. The chest having an arrangement of a Hat cupboard with 4 graduated drawers, all drawers are Mahogany lined and retain the original Rosewood handles, Brass locks, escutcheons and key. The whole raised on a plinth base. Wonderful colour and timber throughout, in immaculate original condition. Stamped to the top drawer "Gillows . Lancaster". English, Circa 1850.